Today marks the halfway point in our series on the five senses – we have already talked about sight and smell…and today we are digging into taste. Smell and taste are closely linked so be sure and listen to last week’s episode about the sense of smell. Both taste and smell use chemical receptors to the brain, and are our more primitive senses. Smell is directly tied to the emotional center of the brain and also closely bonded to our memories. Taste is not as strong in that department, but it still has more of a link than some of the other senses. 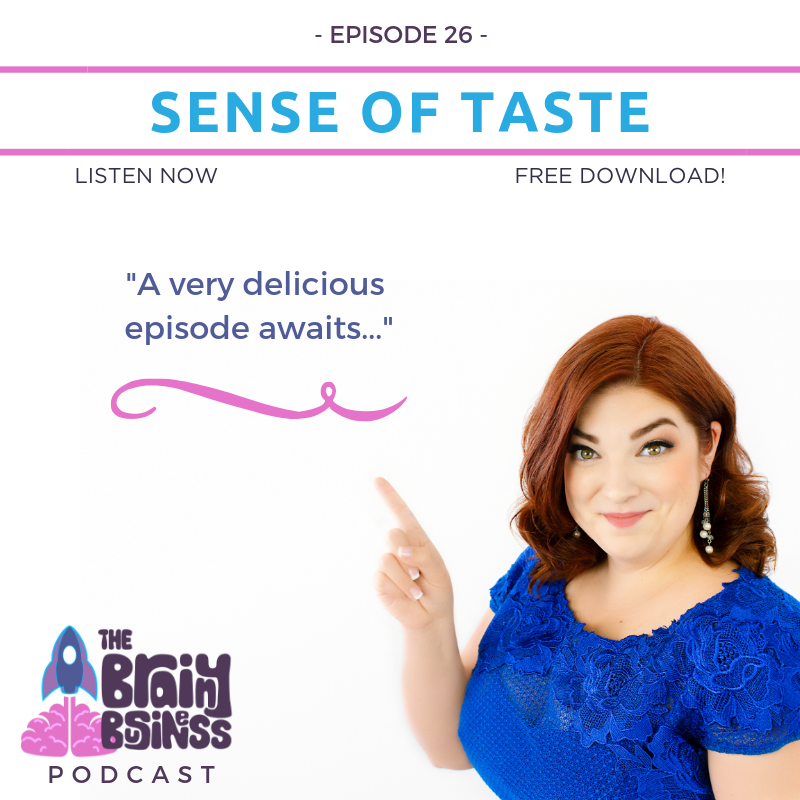 In this episode, I talk about parts of the sense of smell that are closely tied to taste. We dig into mirror neurons for the first time. In case you don’t know, I explain what anosmia is and tie everything into ways to increase and improve your business. [09:25] Smell and taste are closely linked together. Both use chemical receptors in the brain and are more primitive senses. [09:50] Taste and smell are closely linked (unless you have anosmia a condition where someone loses their sense of smell). [11:02] People who lose their sense of smell also lose the majority of their sense of taste. Why? Because taste is actually 80% smell! [11:53] Your olfactory bulbs are bringing in the molecules that help you distinguish between all those scents to help you have a better sense of what you are tasting (and tying that to memories and emotions). [12:41] Our tongue’s 10,000 taste buds can basically distinguish between a few categories of flavors – salty, sweet, sour, bitter and umami (which is sort of a savory flavor). [13:11] The tongue’s taste receptors basically know if something is salty or sweet, but can’t tell the difference between the flavor of a tortilla chip or a pickle. The nose is required for that. [13:36] We can actually taste all flavors at any area on the tongue (and some of the rest of our mouth as well). [13:48] Taste is actually strongest around the edge of your tongue. [13:59] “Spicy” is not a taste – it is a pain receptor. [14:23] The little bumps you can SEE on your tongue are NOT your tastebuds! Those are called fungiform papillae and the taste buds are down between those bumps. [15:02] The tongue absorbs molecules from the foods we eat and sends a signal to the brain, which then determines what category it falls into. [16:25] MIRROR NEURONS These are basically what allow us to “feel” what others feel. [17:21] The story of how scientists accidentally discovered mirror neurons in a lab in 1991. [19:44] Cleaning products used to have the face of Mr. Yuck on them. [20:44] Using food and the sense of taste can quickly backfire on you because of mirror neurons. [22:06] If you ARE selling food – good news! You can trigger mirror neurons all the time and use them to your advantage. [22:28] Studies have shown that taste relies on all the other senses to create a full experience. [22:39] Sight is important. If you have ever watched a tasting challenge on the food network you know that being able to see the food makes a difference. The expectation of what is coming to them impacts the taste. [24:07] Some studies have shown that taste tests for orange juice varied based on color alone. [24:28] Think about eating a potato chip, or celery or popcorn. If you can’t hear the sound of chewing it – that satisfactory crunch – does it impact your perception of taste? You bet it does! [25:33] Touch includes the feel in your hands as well as texture and temperature. These all impact taste. [26:15] When it comes to taste – all the senses are involved because of the way they are processed in the brain. [26:31] Our brains get what they expect. [27:26] Don’t judge a book by its cover? Unfortunately, we do every day – which is one more reason brands matter. [30:37] We know taste is greatly impacted by all the senses. [31:32] When it comes to advertising the taste of something – incorporate all the senses if you can. [34:01] The words you choose, images, smells, flavors, sounds, and everything else matters. [34:52] Everything leading up to the interactions with your brand matters more than what you are selling, the price – and the taste if you have one. [35:11] So always, always be strategic and thoughtful in everything you do.